Some DJs charge more for weddings - others argue that they do the same amount of work for every function so why charge more for a wedding. But who is right? There's only one way to find out .... let's look at the subject in more depth. If you are already a wedding specialist, consider joining the Wedding DJ Alliance®. WdjA promotes the importance of booking a wedding specialist to brides and grooms and generates enquiries. (There is a selection procedure based on good professional practices and your level of experience in the wedding DJ market). Find out more at www.wdja.co.uk. Some people have just too much time on their hands in the AMPdj office! 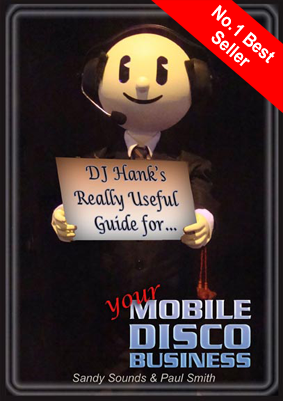 "A Light Hearted Look at the Mobile DJ in the 21st Century" is the result and you can view the first three episodes on YouTube. More exploits from DJ Hank are threatened in the coming weeks so if you like what you see be sure to subscribe to the MobileDJUK channel. This Weekend Sun 20th March in Bournemouth - with demos of Serato, Ableton & Traktor and exhibitors including MixMash & Kaleidoscope Sound & Light. AMPdj has joined forces with NADJ & SEDA to present a day of seminars and workshops for mobile DJs. This is a fantastic opportunity to spend time on developing your DJ skills and improving your business. If you're available (& you don't need to be in any organisation), it would be great to see you there. AMPdj have teamed up with hostsphere to offer all our members Free Linux Web Hosting. The package includes 2Gb space, 20Gb bandwidth, 5 mailboxes, 5 MySQL databases, cpanel, free .uk domain transfer New! WdjA® has been refreshed with new client sites and a dedicated DJ member info & login site.